The Sony Distagon T* FE 35mm f/1.4 ZA Lens is a classic length for group portraits and street photography and features a wide maximum aperture suitable for low light shooting. It is designed specifically for full frame FE mount cameras, such as the Sony a7 series, but will also mount on regular E mount cameras, such as the a6000 or E mount Super 35 video cameras, such as the FS7. It sports near-silent AF thanks to a Direct Drive Super Sonic Wave system and also has a tactile aperture ring that can go from clicked to de-clicked with the flip of a switch. A Carl Zeiss anti-reflective coating minimizes flare and enhances contrast. This lens is ideal for portraits, landscapes, street photography, low light shooting, and for filmmaking. 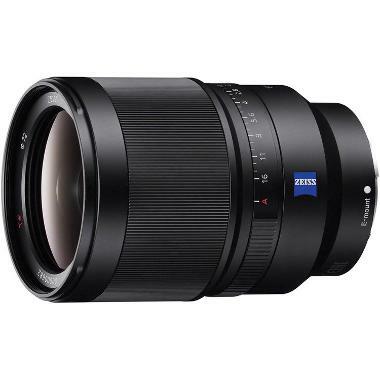 • This lens is compatible with Sony E mount cameras in both full frame (FE) and crop frame/APS-C.